Keep reading to find out how you can enter to win a $60 gift certificate from Novica.com! They say the internet has made us into a global community, and nowhere is that more obvious than with online retailer Novica.com. They bring the works -- and the stories -- of thousands of artisans from third-world countries to people all over the globe! Novica kindly sent me a gift code so I could sample an item of my choice from their website. I think their products and gorgeous and their business model is compelling and I'm so happy to share their story with everyone. Novica, in association with National Geographic, sells products -- home decor, jewelry, apparel, gifts and more -- made by artisans from Asia, Africa and Latin America. Artists post their work on the Novica site for free; Novica allows them to set their own prices. The company makes money when a piece sells, and goods ship directly from the country of origin. There are so many gorgeous things for sale on Novica that it took me ages to decide what I wanted. I knew I wanted a va-va-voom "statement" necklace that I could wear in the evenings, but I couldn't decide whether I wanted a pearl strand necklace, a lapis lazuli necklace, a warmer-toned citrine and carnelian necklace or a smoky amethyst waterfall necklace. But I kept coming back to this dramatic, black-and-white multi-strand hematite and onyx necklace. I sent Alfie the links to my top 5 choices, and lo and behold, he chose this one as well! The fates (or rather, two soulmates) had spoken: I put in a request for the "Midnight Empress". My precious package arrived just one week later, even though it came all the way from India. Isn't the necklace gorgeous? It was a tad shorter than I had expected, and the beads feel like they are strung just a bit too tight, but I'm going to give it some time to stretch out before I pass final judgment. It certainly makes a statement, and I can't wait to wear it on my next date night with Alfie! The necklace itself was only part of the story. It came nestled in an exquisite embroidered-fabric jewelry box. It came with an artisan storycard, which contained a short description of the piece I had bought and the artist who had made it. It also came with a handwritten thank-you card from the artist, Kalyani Gupta. 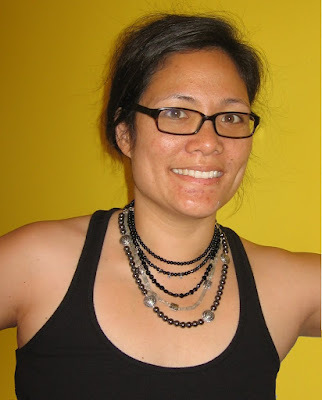 I got to see her photo and read her story on the Novica website, so this necklace is not just another pretty trinket that I've fallen in love with. I've "met" the person behind the necklace and I think we've both been enriched by this transaction! This, I think, is what sets Novica apart -- they stress the artists' stories as much as they do the products. They're clearly not all about profits: they give artists from third-world countries the opportunity to display and sell their work to a global market, thereby giving them the chance to improve their situation in life. I love the wide variety of choices (literally thousands!) in their jewelry line, but there is also a wide price range. I'm no expert on jewelry, so I couldn't figure out why some necklaces cost $30 while others looked similar but cost $130. Was it the materials? Did one artist just charge more for their work? Was it the exchange-rate disparity that made one so much cheaper than the other? It took me a while to browse around and find out that artists actually set their own prices, and Novica charges a commission when the pieces sell. I'm always looking for the best bargains, so I would really have loved some kind of online tutorial to help me make sense of it all. To find Novica's gorgeous, unique products, you'd literally have to go to the ends of the earth -- fortunately, they make it easy for you to find and buy them! And when you buy from them, you'll get that nice warm feeling, knowing that you've enriched both Artisan and Buyer. Win a $60 gift certificate to Novica! 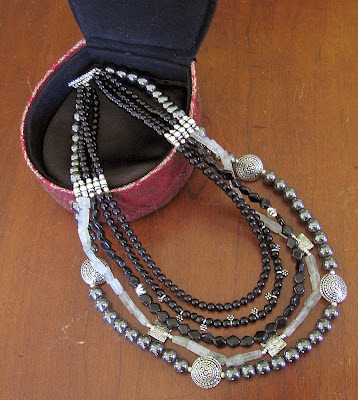 One lucky Bonggamom Finds reader will win a $60 gift certificate that can be applied towards any purchase on Novica.com. 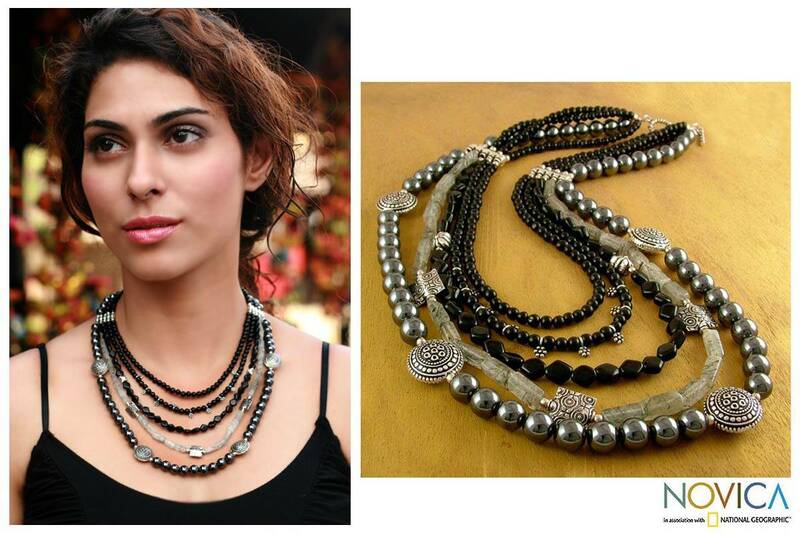 Go to the Novica.com website, then come back here and leave a comment with a link to your favorite Novica necklace. This giveaway ends at midnight PST on June 19, 2010; I will draw a winner at random on June 20 and post the winner's name after the winner confirms acceptance. For additional giveaway rules, click here. Good luck! Disclosure: I received a gift certificate so I could select the sample of my choice from Novica's website, and a second gift certificate will be provided for the winner of this giveaway. I was not paid to review the product or give my opinions. Unless clearly stated, the views and opinions expressed here are my own. The 'Y' necklaces are very nice ...I like so many of them, but I think I would choose the Blue topaz 'Celeste Muse'. Thanks for the chance to win! I subscribed to your email (and confirmed). What a simply stunning piece. My fave necklace! I am so in love with turquoise! I follow your blog with blogger/google friend connect! Love the Garnet pendant necklace, Protection. My pick is the Amethyst jewelry set, 'Purple Clover'. thanks for the contest. I really love the Peridot pendant necklace, 'Taxco Dawn'! I left that comment on the Novica FB wall! I love this necklace and I would really like to win it!!! I follow you on blogger (Wendi P). Thanks again! Wrote on the Bonggamom Finds Facebook wall (Elena Shkinder-Gugel). Follow Bonggamom Finds on Blogger (Elena Shkinder-Gugel). Follow Bonggamom Finds on Networked Blogs (Elena Shkinder-Gugel). Wrote on Novica's Facebook Page wall (Elena Shkinder-Gugel). It's a tough call, but I think that the Grains of Rice necklace may win out. Simple and silver=just my style. The Sterling silver pendant necklace, 'Inner Circle' is delightfully simple and lovely. I love the Leather Cross Necklace "Cosmic Faith"
This necklace reminds me of my Mom's style! I posted this giveaway on your Facebook wall.